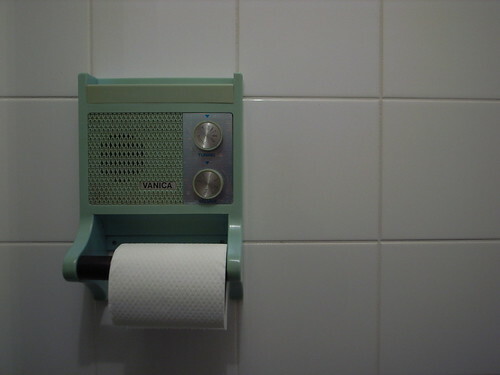 One of the mysterious encounter of this week in Amsterdam was this truly nice radio mounted on a toilet paper-roll, designed by Vanica. "Advantages: You are entertained when using the toilet. You learn a lot of snippets of knowledge at random. Learning is automatic and without commitment in an environment usually devoid of intellectual sound. You can always tell if someone else is using the toilet even if they do not lock the door and do not whistle, as you can hear the radio. After the installation of the toilet radio, everyone remembers to shut the toilet lid after use (because no-one is so careless that they'll wastefully leave the radio on!) As you use the toilet at night sometimes, you get to hear unexpected items on nighttime radio. Makes good humour in relation to something considered taboo. Visitors make comment on the ingenuity and comedy value of the toilet radio arrangement. Why do I blog this? certainly an intriguing combination of artifacts, nice to observe and worth a try. This encouragement to stay in this 4th place (i.e. toilet) was however contradicted by an automatic shut-off light system that obliged to wave my hands above my head (where the motion detector was located). What an experience only to keep listening to radio programs. Describing a framework, but why?